Aphids, mealybugs and scales are the most common sap sucking insects in the garden. Along with whiteflies, aphids, mealybugs and scales belong to the suborder Sternorrhyncha of the Hemiptera family. This information sheet describes their biology and the control and prevention of these plant pests. 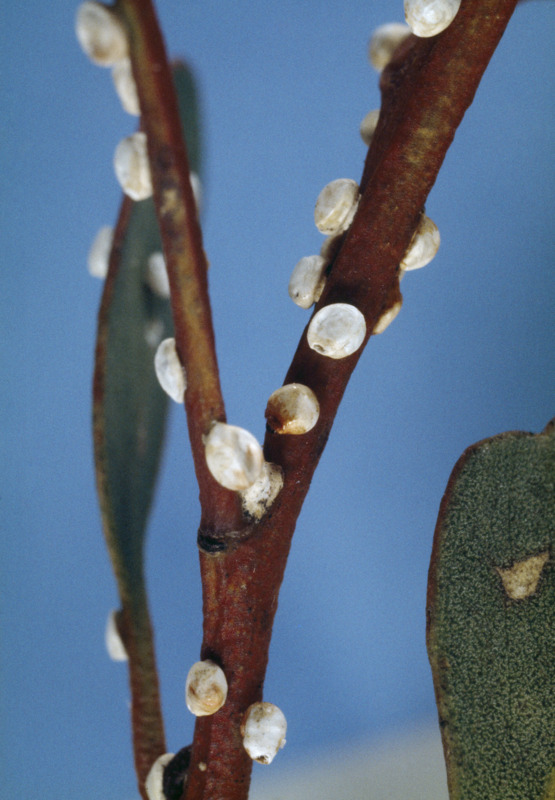 Aphids, mealybugs and scales appear on plant parts in clusters and feed on the sweet sap by inserting a needle-like sucking tube into the plant and drawing out the juice. After the sap has been used by the insects, it is excreted as honeydew, which forms the base on which a black fungus grows. This fungus is known as sooty mould and its presence reduces photosynthesis and discolours affected fruit. Honeydew is used as a food source by ants, which actively transport the insects (aphids, mealybugs and scales) and position them on the plant. Ants may spread sapsucker infestations between plants via underground tunnels. As aphids, mealybugs and scales congregate in hidden places, or on the lower leaf surface, they may initially not be obvious. Affected plants appear water-stressed and leaves turn yellow and fall. In some cases leaves and flowers curl up and wilt. Aphids, mealybugs and scales all have the potential to transmit viruses between plants. However, aphids are the most likely transmitters. Most aphids are soft bodied, pear-shaped insects, 1-2mm long, which prefer feeding on tender growing shoots. In Western Australia, most aphids are females which are able to give birth to living young without the need to mate. Reproduction is fast when weather conditions are favourable, leading to a rapid build-up and aphid population outbreaks. Cold conditions slow their rate of development and movement. Normally, the whole family will be found feeding together. The young aphids (nymphs) go through several growth stages, moulting at each stage. Nymphs do not have wings. When conditions are favourable and aphids have no reason to migrate, most adults will be wingless. However, when plants become unsuitable habitats, or when overcrowding occurs, winged aphids develop and migrate to other plants or crops. Winged aphids may originate in weeds or neglected garden plants in the neighbourhood. They are less likely to come from strong, healthy plants. Even when disturbed, aphids move quite slowly. There are many aphid species and they attack just about every type of plant. They also come in many colours. All aphids feed by sucking on plant juices and they may transmit plant diseases at the same time. The leaf distortions so often seen with aphids are mostly caused by transmitted viruses. Aphids are most active in spring and autumn. Aphid infestations, which originate from nearby, can be prevented by removal of host weeds and neglected, stressed plants, and by keeping target plants well watered, fertilised and healthy. Encouraging beneficial organisms which attack aphids, such as ladybirds, hoverflies, parasitic wasps and lacewings, will help to keep aphids to a minimum. Beneficial organisms can be supported/encouraged by using minimal amounts of broad spectrum pesticides. Aphids can be removed from plants with a jet of water, squashed with finger and thumb or sprayed with organic garlic and chilli sprays. Sprays with horticultural soap will desicate and suffocate the insects and horticultural oil will smother the insects but these organic products should not be used when the weather is above 32°C as plant leaves can burn. Alternative products are the low toxicity, residual chemicals imidacloprid and acetamiprid.